Last year's LG G2 was a marvel of hardware stuffed with miserable software that made the phone a perfect case for ditching bloat and rooting it, as unappealing as that option might be to normal folk. So I had a feeling that this year's G3 would bring more of the same. After spending a few minutes with the G3, I can safely say the whole package is so much better than I expected. LG's G3 has a big 5.5-inch display, but it doesn't feel at all like a clumsy giant—it's more of a sleek beast; a station wagon that handles more like a sports car. Its overall shape owes a lot to the wonderful Nexus 5 that LG built for Google, but the slick metallic back and slightly rounded sides, could almost be the latest HTC One. The thing feels slim, and though LG had the phone tethered to a security cable, I could feel that it's not unwieldy like burly phones of similar size, like for example, the Galaxy Note 3. As an everyday phone for normal people the G3 is going to feel like a light and leisurely tool. The display itself seemed pretty standard despite its high PPI count. LG has opted for a softer palette for its new software UI, but even then you can tell that the new screen won't have quite the saturation and pop of the Super AMOLED display in the Samsung Galaxy S5. That's not necessarily a bad thing—and it might actually be more accurate— but to the untrained eye it might seem lifeless. Compared to competing hardware with much smaller screens, like the Samsung Galaxy S5 and the HTC One in the images below, the G3 is impressively slight and slender. The phone's defining hardware element turns out to be not its size, but the single back button interface. If you're used to bunches of pressables on on competing phones, the streamlined design is almost disorienting. We learned last year that you can definitely get used to it. This time around, LG tweaked the aesthetics to make it nearly invisible. Very elegant. Following the trend with Android software, LG has built a new skin that's flat, meaning it doesn't have unnecessary ornamentation. The basic interface looks like stock android in pastels. LG made a big deal about how typing on the new keyboard would be a piece of cake. The new keyboard UI ain't pretty, but it's certainly serviceable. It usually takes me a a while to get used to typing on a new phone—especially a phone with as much screen real estate as the G3—but I didn't have any problems diving right in. Another important addition to the G3's interface is the new Smart Notice assistant-like tool which lives as a widget on your homescreen. It's designed to pull information from you actual phone usage and feed you back actionable tips or suggestions. (The contrast is supposed to be competitor information feeds that pull from your social media accounts.) While you definitely can't evaluate this tool all the way on a phone you haven't been using for a while, it seems like it would be at least useful. A minor critique is that its implementation looks like a bunch of undifferentiated sticky notes. Not pretty, but we'll take useful over pretty any day. 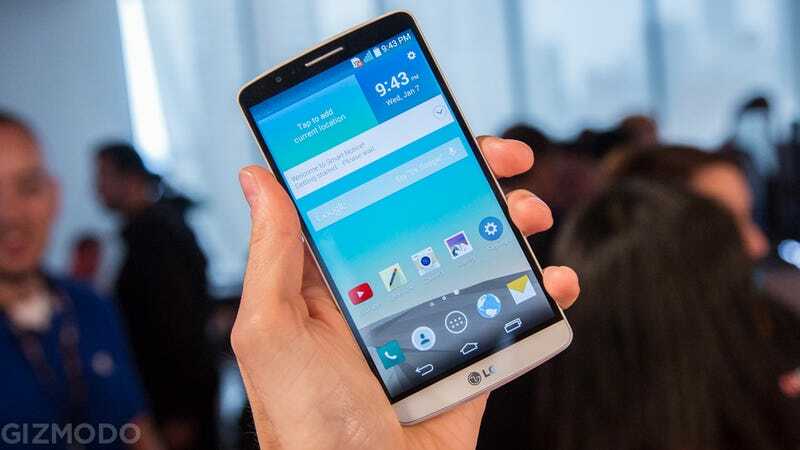 The LG G2's camera was excellent and in announcing the G3, the company made a new "laser focus" feature sound like something from the future. In comparing it to the focus on the Galaxy S5, it wasn't noticeably better. The 13 megapixel rear camera's photos were sharp and nicely balanced, as far as we could tell from images displayed on the phone's screen. We didn't mince words when it came to LG's G2: It was braindead, even if he hardware was beautiful, and even if the chipset was powerful. The G3's hardware has gotten big—almost huge—this time around, and it's done so without losing a touch of its former elegance. What's encouraging to see this time around is that LG's software appears to be catching up, though, it succumbs to some of the pitfalls that the proprietary Android skins from all manufacturers do: We'd still rather have stock Android. Without doing a full review, it's hard to say for sure how far LG as come with the G3, but if you're the person using it, we're almost certain you'll be happier with this phone than with almost any other.